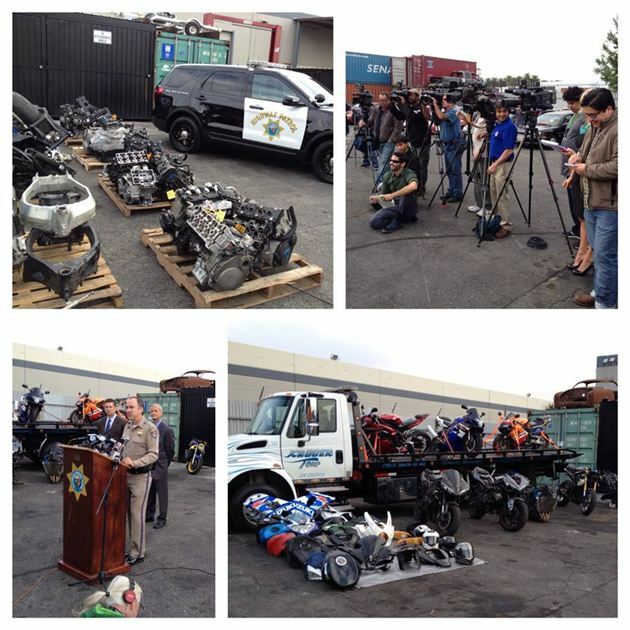 CHP Southern Division provided these photos from its December 18 press conference in Compton, California. Glendale, Calif. – Southern Division Special Services, Vehicle Theft Unit, completed a long term “sport bike” motorcycle theft investigation dubbed “Operation Wheel Spin.” This operation was spearheaded by CHP Auto Theft Investigators to combat an increasing number of sport bike thefts in Los Angeles County.As the investigation progressed, investigators identified several professional motorcycle theft rings, their methods of operations, and their facilities used to dismantle the stolen motorcycle to be later sold as component parts. Additionally, it was determined many of the suspects were using the internet and social media to sell and distribute the stolen motorcycles and components. Operation Wheel Spin also exposed an insular group of individuals who were involved in a multitude of crimes which included, but was not limited to, robbery, larceny, burglary, fraud, and identity theft. Operation Wheel Spin spawned several ancillary criminal investigations, some of which were investigated in San Diego County and Las Vegas, Nevada. Operation Wheel Spin culminated with over 100 criminal complaint filings by the California Attorney General’s Office. This entry was posted in Blog and tagged parts, stolen motorcycle.